ETTA SCHOONMAKER IVES vs. BERKSHIRE WHITE PORTLAND CEMENT CO., its successors and assigns, and HARRIET T. BARNUM and MARY HULETT. On October 8, 1976 this petition was brought to quiet title to a certain parcel of land containing 31.29 acres more or less on the westerly side of the Konkapot River in New Marlborough, Mass. shown on Appendix A. [Note 1] Title is claimed by adverse possession. A motion to intervene in the case brought by Harriet T. Barnum and Mary Hulett was allowed by the Court April 25, 1978 and an answer and a counterclaim was filed by the pair. Later on August 24, 1979 Mrs. Barnum and Mrs. Hulett filed a complaint to quiet title in themselves to the same parcel of land claimed by petitioner, as well as another parcel on the easterly side of the Konkapot River (Land Court Misc. Case No. 96044). The two cases were consolidated for hearing. Prior to the trial in Great Barrington July 30, 1980, at which a stenographer was sworn to take and transcribe the testimony, Mrs. Barnum and Mrs. Hulett relinquished their claim to that land westerly of the Konkapot River claimed by petitioner Ives. Mrs. Ives and Mrs. Hulett testified at the trial and two exhibits which are incorporated herein for the purpose of any appeal, were entered into evidence. 1. By a deed dated June 4, 1907 recorded in Book 201, Page 67 at the Berkshire Southern Registry of Deeds [Note 2] one Godfrey Goldmark conveyed to the Berkshire White Portland Cement Company, along with other land, the parcel of real estate bounded easterly by the thread of the Konkapot River and westerly by the Clayton-Southfield Road shown on a plan dated February 1978 entitled "Portion of Land of the Berkshire White Portland Cement Company" drawn by Robert Macy and Associates (Exhibit 1) - see Appendix A. 2. By deed dated May 3, 1910, recorded in Book 209, Page 6 the Berkshire White Portland Cement Company conveyed a portion of the property obtained from said Godfrey Goldmark, not including the above described parcel, to one George W. Greene. This conveyance is the last transfer of property by the Berkshire White Portland Cement Company on record at the Berkshire Southern Registry of Deeds. 3. The Berkshire White Portland Cement Company, a corporation existing under the laws of the State of Maine, has bee dissolved. Although there has been an intensive search made in both Maine and Massachusetts, there is presently no record of its existence nor of any of its officers, directors or stockholders. 4. 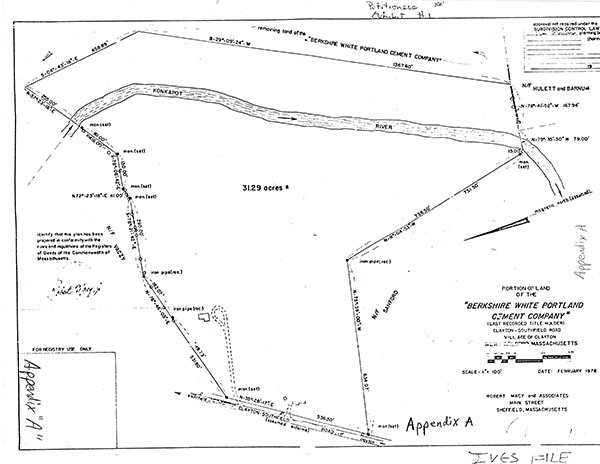 In May 1946 petitioner Ives and her husband entered into possession of the cement company's property west of the Konkapot River as shown on Appendix A. The area had been used as a dump and she and her husband transformed it into a liveable site for their family. They repaired a dilapidated five room two story house on the premises and had all the necessary utilities as well as indoor plumbing and a septic system installed. They have repaired the driveway running some 200' from the Clayton­Southfield Road to the house at least three times and continue to maintain it. Since 1947 they have maintained a barbed-wire fence along the northerly boundary of the premises extending in a meandering line from the Clayton-Southfield Road easterly to the Konkapot River. The Ives have also, since taking possession of the property, maintained a wire fence along the southerly boundary. They surveyed this line and placed "cement markers" at 500' intervals on the line. They have "hayed" the lot and have grazed their horses and cows over it; have cleaned the brush from the land and have cleared a garden patch and an area where they used to keep chickens; have cut firewood from the "back hill" on the premises where they also have camped and picked berries; have frequented the stream with their several children for swimming and fishing and have picnicked by it. On a portion of the land near the road the Ives have set a trailer where some of their children have lived. Petitioner Ives has paid all of the real estate taxes on the property since 1947 to date. The sole question is whether or not the petitioner has acquired title by adverse possession to the parcel west of the Konkapot River. See Appendix A. Petitioner has relinquished any claim to title by adverse possession in the portion of the cement company's land east of the Konkapot River, conceding that the intervenors have occupied the same adversely to them as well as all others for over twenty years. By the same token, the intervenors herein have relinquished any claim they might have to title to that portion of the property west of the Konkapot River. In order to acquire title to the premises by adverse possession petitioner must prove actual, open, notorious, exclusive and uninterrupted use of the premises for a period exceeding twenty years. Wonson v. City Manager of Gloucester, 1 Mass. App. 880 (1974); Uliasz v. Gillette, 357 Mass. 96 (1970); Ryan v. Stavros, 348 Mass. 251 (1964). Upon all of the facts the Court finds and rules that petitioner has sustained her burden of proof. The Court orders that judgment issue that petitioner has acquired title by adverse possession to the 31.29 acre parcel of land bounded easterly by the Konkapot River and shown on Appendix A. [Note 1] Appendix A is a copy of Exhibit 1 reduced in size and with markings made by the Court. [Note 2] All book and page references are to documents on file at the Berkshire Southern Registry of Deeds unless otherwise indicated.